At mandala Soul you will find a wide range of different yoga classes. All our teachers are certified and trained in their specific style of yoga. As a student you always go to your own bodys extent. We’re just here to guide you and yoga is supposed to be pleasure and not pain. You step on the mat for your own sake and there’s no one else you should be comparing to except yourself. Some classes are divided into level 1 and 2 so that the class suited for the students previous experience. Other classes are adjusted to the experience of the students attending. Hatha Yoga is one of the most popular styles of yoga. The word Ha means sun the word Tha means moon, so it’s basically about balancing the masculine(sun) and the feminine(moon) energies within ourselves. This is done by holding the asanas, or poses, during several breaths. By doing this we train and still our mind and at the same time we’re building strength. Pranayama or breathing exercises are also included in class, along with meditation. This will help us to still and calm our minds and to prepare for the asanas. Suits: Everyone. Even if you every now and then will stumble upon a pose that you haven’t quite mastered yet = a good reason to practice at home. Vinyasa Flow is a bit faster kind of yoga. Vinyasa literally means “to place in a special way” and focus is on combining movement with breath into a flow. Unlike Hatha Yoga we’re not very much static the poses but instead we move from position to position to the rhythm of our breath. A bit more physically challenging class where we build both strength and stamina. Suits: Someone who tried yoga at least once. A bit of BASIC physiQUE is good but you will build it up AFTER TIME if you keep coming to class! We hold the positions for up to five minutes and work slowly into them. In this way, we work the body's connective tissue instead of stretching out the muscles. A perfect complement if you are very active since it prevents injuries and increases the circulation in the body. All postures are done sitting or lying down and you do not need any form of basic physique to be able to participate. Kundalini Yoga unites body and mind to create an inner balance. It’s a bit different to other types of yoga because it’s a bit more spiritual. It contains everything that the yoga tradition has to offer; mantras, pranayama, bandhas(body locks), asanas and meditation. Suits: Everyone; especially if you want a calmer practice, have ace in your body and looking to find both physical and mental relaxation. Did you know that the best time to do yoga is before sunrise? Come and try out Annie’s and Eleonor’s different morning classes. We will use a set sequence so that you recognize the poses and turn your focus inwards. It also makes it easy for you to notice your progress! Yoga is preferably to be practiced on an empty stomach so come before breakfast. And you will most definitely have a good day ahead of you! A type of yoga for both adults and children. Give yourself and your child/children an opportunity to just relax and socialize. Erica will tell a fairy tale contained with easy yoga sequences that everyone can participate in. We recharge with creativity, positive energy and relaxation. Everyone gets a fruit as well! This is our most fundamental class. We won’t do any advanced poses and everything is taught in a slow manner so the one who is completely new to yoga can follow along. The content of the class varies a bit from teacher to teacher but always with easy and basic poses. Even for someone who practiced yoga for years it can sometimes be good to go back to basic! Yoga for all your senses. The asanas from Yin Yoga is combined with flowing movements. A class that helps you connect with your body, your creativity and your inner well-being. You’ll get to enjoy relaxing music, guided meditations, mantras and more. An exploration of the body mind and spirit, in a slow tempo. Do you feel stressed? During this class the focus is on slowing down and taking it easy. We do not go into any deep stretches and use props such as blankets and blocks to get into passive positions where you don’t have to do anything else but breathe. Both Antonio & Eleonor will guide and adjust you in asanas that reduces stress and anxiety. We finish off with a long and relaxing Savasana. The class is in English. Does the time for our classes not fit into your schedule? Or do you want to deepen your practice by going through each position in more detail? Then a Yoga 101 session is something for you! 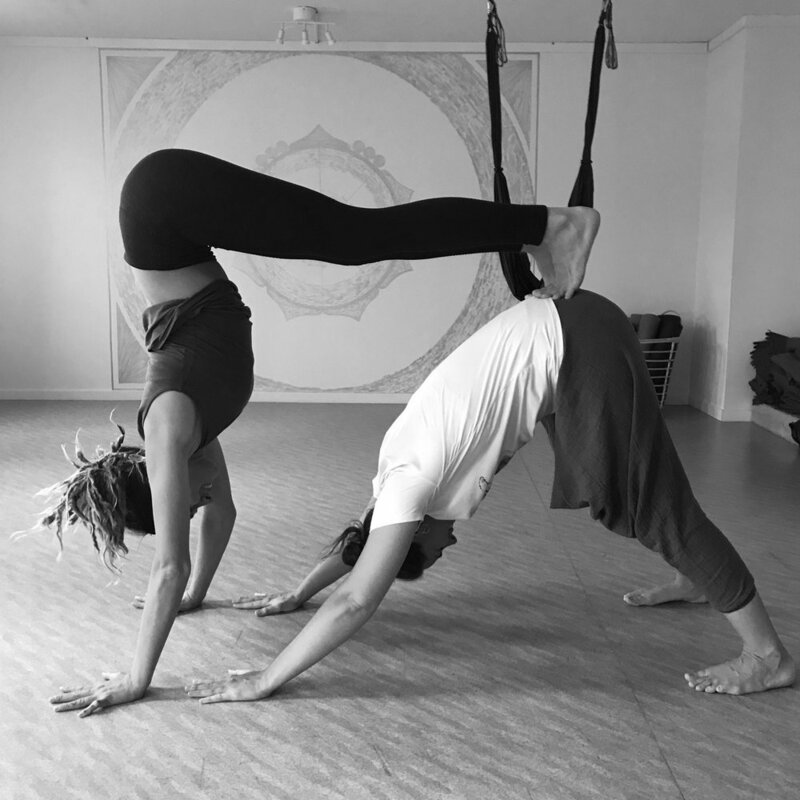 During 60 minutes with the help of a certified yoga teacher you will go through the positions you are struggling and get exercises specifically designed to suit your needs. Like having a PT in yoga! You don’t have to sign up for a number of sessions, but book yourself in from time to time and agree on a date/time that suits you and the teacher that you choose to practice with. At the moment it’s Antonio or Eleonor.